Social Media Marketing is a great way to enhance your business’s visibility, gain new traffic, and build strong, lasting relationships with your current and potential customers. By sharing professional-looking, engaging, and relevant content, the sky is the limit for your success on social media. 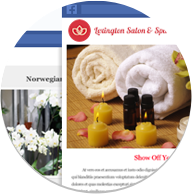 Create beautiful ads from scratch or use an existing design to target specific users and promote your business on Facebook. With Social Media Marketing you can easily launch professional tabs to grow your Facebook page, turn your visitors into leads, and your leads into customers. Engage your fans with relevant content and designs that you can find, customize and schedule in a single easy-to-use tool. 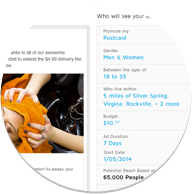 Run promotions that engage, reward, or encourage your fans to keep coming back and share with potential prospects. During the free trial, you can design and publish a custom Cover Photo and custom Facebook pages. The free trial offer lasts for one month. If you cancel before the trial ends, you will have paid nothing and will owe nothing. To cancel, simply call us (toll-free) at 1-866-811-1674 or visit your dashboard for a self-cancellation option. The package fee will only be charged when the free trial offer period ends, and will be charged monthly to the credit or debit card used for your order. Yes! You have the option to select from hundreds of Custom Tab designs in our gallery to present a different look for your Facebook Page, and you can update your Cover Photo at any time. Once you create a Facebook page for your business it is important to spread the word and generate more fans. Be sure to include your Facebook page URL (e.g. www.facebook.com/YourBusinessName) on your business cards and other marketing materials. It also helps to add a “Like Us” link on your website. For more ideas, visit your Facebook dashboard which includes a checklist of helpful tips and tricks to help you promote your new page. 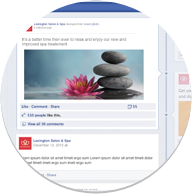 How do I edit my custom Facebook pages? 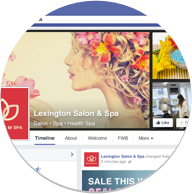 Editing a custom Facebook page is simple using Vistaprint Social Media Marketing. Once you checkout, you will be given a link to your Dashboard. This is where you will find your account information and resource center, as well as tools to help manage and track your activity on Facebook. 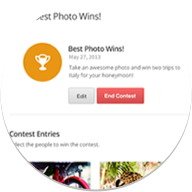 From the Dashboard, click on the "Edit Cover Photo" button to enter the Cover Designer, or the "Edit Custom Tab" button to enter the Custom Tab Editor. Tabs – tabs are accessed by clicking the square images below your cover photo. These tabs link to pages that are embedded within your Facebook page. You can customize your tabs to welcome your visitors, tell them about your business and showcase your products or services, or even connect your Twitter, Instagram and Pinterest feeds. Canceling your account is easy. Just call us (toll-free) at 1-866-811-1674 or visit your dashboard for a self-cancellation option. When you call, we may ask you for feedback about how we can improve our service. We appreciate any comments you may have, as we are always trying to improve our service.